Just in time — phew! Otherwise we would have had either Eternal Hellfire or an eternally falling “standard of living.” Which will it be? 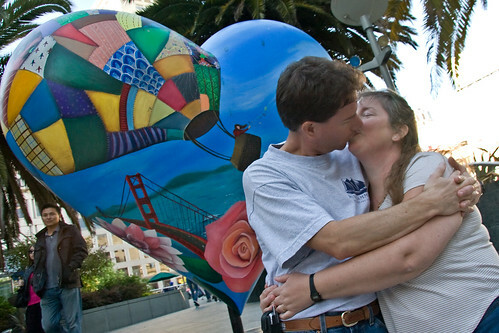 SFAppeal writes that MTC and BAAQMD will be lead funders of a bay area bike share program pilot beginning 2011. This is good news — we’ll finally join DC, Paris and about 100 other Euro cities in having real “public” bikes. (Not to be confused with SF start-up “Public Bikes” which are made for yupsters.) San Francisco will reportedly receive a 50 bike fleet, which leaves 950 bikes for other bay area cities. We’d guess: San Jose-Sunnyvale-Mt. View-Palo Alto, Berkeley-Emeryville-Oakland, and perhaps others. Naysayers will pooh-pooh bikeshare saying that cyclists aggravate traffic for private car, delivery truck and bus drivers and cause accidents. There are rude bikers who flout traffic laws, just like there are drivers who do so. Other people will say that bicycling saves lives — that you are “safer on a bicycle than on a couch” (ie, heart disease, etc) as the Dutch government says. Personally I dislike that this is being funded to a lesser extent than electric cars, but every little bit helps! Next post: a take on the Oakland Mayor’s race. Urban Releaf will lead a street demonstration of its groundbreaking new research project along two blocks between Market Street and Martin Luther King Jr. Way in West Oakland, where tree canopy is currently non-existent. UC Davis scientist, Dr. Qingfu Xiao will showcase innovative tree wells using special rocks and soil that save water. Community leaders, state and local, are scheduled to participate in the demonstration. Urban Releaf continues its groundbreaking research on the water benefits of urban forestry. Following the success of our Ettie Street watershed research and evaluation projects funded by the statewide CALFED Watershed Program, we are launching a cutting-edge research and demonstration project with Dr. Qingfu Xiao, a water scientist with UC Davis Department of Land and Water.According to the Center for Urban Forest Research, trees in urban areas mitigate air pollution, beautify the neighborhood by adding greenery and shade, save on heating and cooling costs, build a sense of community, and provide opportunities for green job training — all in addition to saving water. “We are looking to spread the word and demonstrate the myriad water benefits of our city’s trees. Cities all over the world are facing water crises and are seeking water- sensitive tree well design and approach to urban forestry like this,” says Kemba Shakur, executive director of Urban Releaf, the Oakland nonprofit leading the project. The state Department of Water Resources Urban Drought Mitigation Program provided funding for this project to educate local residents on California’s water shortage and the importance of conserving water. The project also received funding from the West Oakland Project Area Committee Neighborhood Projects Initiative Program. Other partners include the City of Oakland, West Oakland Greening Project and UC Berkeley. We are always open to collaboration with other partners! To get involved, or for more information, please contact Jane Wardani, Urban Releaf Project Manager, at (510) 601-9062.
partner of Urban Releaf’s work in the past few years, supporting the planting of thousands of the trees in the project area and throughout Oakland. –	DWR Calfed Watershed Program has also funded water quality research in the Ettie Street Watershed in West Oakland in partnership with Center for Urban Forest Research and UC Davis researchers. Our research and modeling established that planting 1,800 trees in the watershed would prevent 9 million gallons of contaminated runoff from entering the San Francisco Bay. More info on this project is on our website. –	We also have an active contract with the DWR Watershed Program to conduction evaluations on the socio-economic and environmental benefits of urban forestry in this historically disadvantaged, environmental justice community of West Oakland. Reading the Richards — Heinberg and Register — is a must for serious sustainability planners, thinkers and operators. No one can think about all issues at once, but all issues must be considered at large and in phases during both development and deconstruction. And of course there are many great sustainability-minded thinkers and Hyde Park soap box contestants. Read Register’s latest EcoCity sermon here. On college campuses everywhere the metal water bottle has become the norm. What about those red solo cups, we wonder? I’d like to see an enameled steel, or titanium, version but haven’t seen any to date.